The above extensions may be dialed from any campus telephone. Whenever appropriate, the Seminary interacts with local law enforcement and emergency service agencies in response to reported incidents. Prompt notice regarding the occurrence of crime is provided to all members of the Seminary community through verbal, printed, electronic and/ or telephone communication as deemed most expedient. The Seminary grounds are surrounded by a perimeter wire fence (and natural barriers). The only normal access to the campus is through an electric gate at the entrance on Upland Road. Each member of the Seminary community is issued an electronic card that activates the gate. Most buildings on campus are unlocked during regular business hours. Individual offices and classrooms are locked at the end of the day. Each seminarian (resident student) is issued a dormitory room key. Members of the faculty and staff are issued keys that allow access to areas and facilities necessary for the normal conduct of their duties. Lost or found keys and electronic gate cards are to be reported immediately to the Director of Students or to the Facilities Manager. Safety and security in certain areas (e.g. weight room, swimming pool) are maintained through a number-locked pedestrian access, the combination to which is made known to bona fide members of the community. Most campus facilities are accessible to visitors upon gaining access through intercom identification at the gate. Their presence on campus is understood to be in relation to some member(s) of the Seminary community and in their company. From time to time groups make use of campus facilities through prior arrangement with the Seminary administration. Residence areas are generally off limits to visitors. Family members of seminarians, however, may visit during designated periods. Every member of the Seminary community is expected to keep his/her personal area(s) secure, especially outside business hours and when away from premises for extended periods of time. 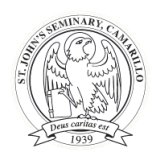 Suspicious activity by visitors or members of the Seminary community is to be reported to the Director Students, or to the Facilities Manager if direct inquiry and/or confrontation seems inadvisable. All security concerns and deficiencies are to be reported to the Director of Students or the Facilities Manager for prompt action. The Facilities Manager routinely assesses the level of safety and security on campus to identify areas that need attention. The Seminary Administration is primarily responsible for monitoring the proper conduct and behavior of the interacting members of the Seminary community. In particular, the Director of Students is charged with overseeing a community life conductive to the mission and goals of the Seminary. As such, disruptions to safety and security are of particular concern to the director. Nevertheless, safety and security are everyone’s concern and all are expected to uphold standards for their proper maintenance. Any and all crimes are to be reported to the persons or agencies listed previously. As a Christian community, it is a goal of the Seminary to foster harmonious and peaceful interaction among all members of the Seminary community, including a sense of responsibility for the well-being of one another. It is to this interest that the Seminary makes regular reminders that reinforce community awareness of safety and security concerns. This is particularly so during one of the various sessions of Orientation Week conducted at the beginning of every academic year. This session provides instruction and practical suggestions for maintaining security and safety standards on campus.